Goal: Build upon the success of The Lodge by creating a second phase that would be adjacent and have programmatic synergies. Situated just a couple hours south of San Francisco, in the scenic town of Morgan Hill, The Huntington is one of CDP’s newest builds, completed in the Fall of 2017 and designed for seniors earning 50-60% of the area’s median income. Adjacent to The Lodge, a senior retirement community built by CDP in 2014, this new complex is a four-acre, 114-unit senior congregate care apartment community designed specifically to promote resident interaction in a soothing and relaxing environment, loaded with life-enhancing amenities. As a complement to The Lodge in both function and architectural character, the Huntington consists of one, two, and three-bedroom units dedicated to independent living within a thriving, dynamic community. 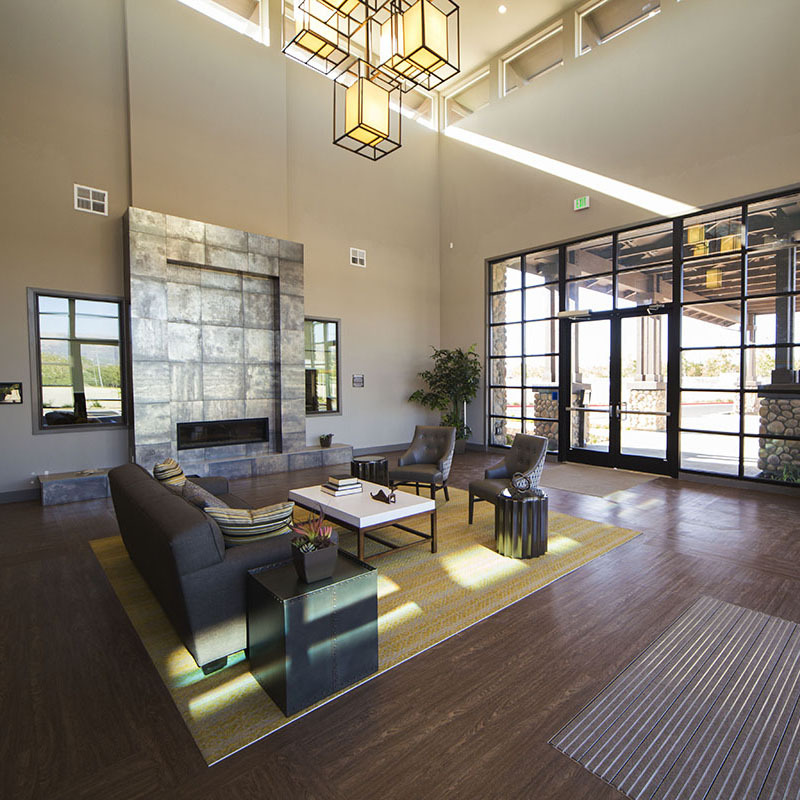 Common areas are abundant throughout the community, including a communal dining hall and a fully equipped, commercial kitchen—not to mention a theater, two exercise rooms, library with fireplace, community and game room with kitchen. In addition, The Huntington offers an outdoor dining patio so residents can take advantage of the pleasant, year-round California climate. Other outdoor spaces include courtyards perfect for a variety of open-air recreation activities, as well as a number of community garden areas and a putting green. A crucial part of most CDP projects are the non-profit organizations that partner with CDP to offer invaluable services for residents. At The Huntington, the San Jose-based food-assistance group Loaves & Fishes has created a program that provides three meals every day to residents at no cost to the residents. The Huntington is more than just a standalone CDP project; it represents the second phase of our Morgan Hill community, born of a distinct vision for low-income senior housing that also provides enriching experiences and a supportive, thriving community that perpetually stimulates the lives and minds of its tenants. This project came to fruition after several years of entitlement work, aided by a patient seller and a strong market. As with any new build, there were ample constraints—including entitlement difficulties, Congregate Care limitations (e.g. half-size kitchens in units), steep construction costs, and a shortage of skilled labor—but CDP was able to push forward and, ultimately, pool its knowledge, network and resources to take full advantage of this rare opportunity to provide a significantly sized project for Morgan Hill that will provide permanently affordable housing to seniors aged 55 and up in an amenity-rich environment for generations to come. low- and moderate-income seniors. The program is delivered on-site at the communities where seniors live and is considered one of the best practice models in the country, having been funded for expansion by two major philanthropy organizations. The continuing mission of EngAGE is to create healthier environments in senior housing and behavioral change in older adults and families that translates into significant improvements in health and quality of life. the community. We felt that having an on-site art collection culled from the local art community would be a meaningful way to establish a connection between the residents and their new home. In order to nurture an organic connection with the surrounding community that would install a far-deeper sense of place, AFTA spent a year networking with and hand-selecting 25 artists to feature in this carefully curated collection. In a truly symbiotic effort that benefit both The Huntington and Loaves & Fishes, this food-oriented non-profit (which serves both San Jose and South Santa Clara County) operates our commercial kitchen to provide our residents with three meals a day at little or no cost. In return, they utilize our kitchen, rent-free, to pursue their larger mission of feeding people in the surrounding community who don’t have access to healthy meals.